This is a fabulous gift for any Aston Villa FC fan and is approved and fully licensed by Aston Villa FC. 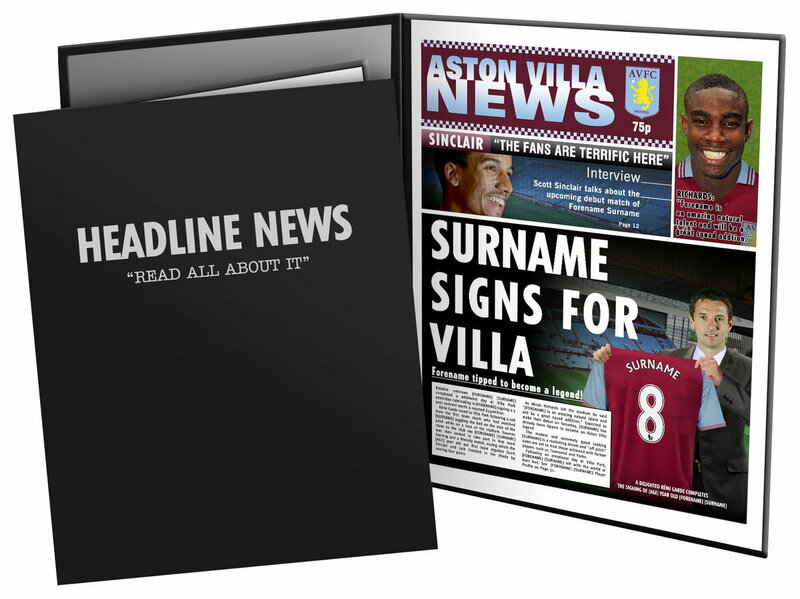 Be the star on the front page with this personalised Aston Villa FC Newspaper as you become the manager’s new signing. We merge your recipient’s details throughout the article text and headlines of the Aston Villa FC News. One of our best-selling Aston Villa gifts of all time, this personalised dressing room photo is the ultimate must-have for any Villains fan. This official, fully licensed Aston Villa FC Personalised traditional style whisky glass can be used on a daily basis or put on display as a memento. One of our best-selling Aston Villa FC gifts of all time, this personalised dressing room photo is the ultimate must-have gift for any Aston Villa FC fan. This official, fully licensed Aston Villa FC Personalised pint beer glass has a simple conical design with a solid base. One of our best-selling Aston Villa FC gifts, this 8oz hipflask is a fabulous present for any Aston Villa FC football fan. This truly stunning engraved hipflask is a fabulous present for any Aston Villa FC fan and is an approved and fully licensed product. Our personalised Street Sign Mug is a fabulous present for any Aston Villa FC fan and is approved and fully licensed by the club.